Inquest on Bouvet is a curiosity – a Maigret novel in form and setting, but one from which the Inspector himself is absent. The plots concern the death of the title character, an old print collector who has lived quietly for twenty years in an apartment by the Seine. Over the course of the novel various characters emerge and we learn that Monsieur Bouvet is not who he appeared to be. The plot is formulaic and unconvincing – Bouvet it turns out was not only a fugitive murderer, but also the super-rich owner of a Congolese mine and a wartime spy – and there are tiresome passages of expository dialogue. 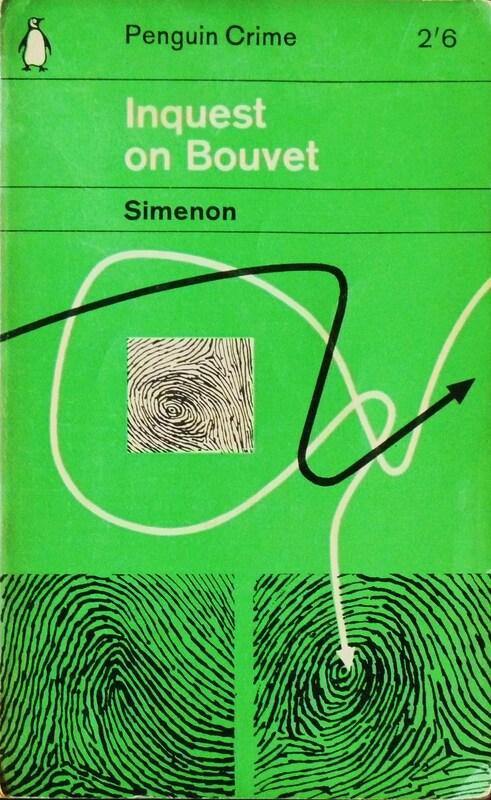 Bouvet is a emblematic Simenon character: an outwardly unremarkable man with a hidden past or double life. Many Simenon protagonists disappear or long to disappear: Bouvet is a character who has done his disappearing earlier in life. In death, those from whom he has run away catch up with him. Aside from its status as a curiosity, the chief point of interest of Inquest on Bouvet is in its portrayal of the character of Madame Jeanne, the concierge in Bouvet’s apartment building. Madame Jeanne has a ne’er-do-well husband, who works nightshifts and drinks, but it is to Bouvet that she was devoted. It was she who brought the old man his meals and scrupulously cleaned his apartment and in death it falls to Madame Jeanne to arrange the wake. Over the course of the novel, as others take possession of Bouvet’s life, Madame Jeanne’s little world is violated. Of course, she bears this with dignity – it is not her place to assert her rights over those who have a greater claim to Bouvet under the law. But she remains the fulcrum, granting access to the apartment and, to those of whom she approves, providing a little information about the latter years of the dead man’s life. The novel ends with a depiction of the funeral cortège leaving the apartment block. Madame Jeanne defers to the arrivistes in the allocation of seats and ends up in the final carriage of the procession with a tramp to whom Bouvet gave money and a moon-faced former prostitute and former lover of Bouvet, Mademoiselle Blanche. On the way to the cemetery, the carriage is separated from the procession by a lorry ‘as if it weren’t part of the same funeral’. The figure of the concierge is the very archetype of Simenon’s world: an onlooker, rather than a participant in life. While others come and go, the concierge is stationary. She observes, but is herself invisible. Life quite literally passes the concierge by. Over the course of this otherwise unremarkable novel, while other characters distract us with their histrionics and tedious revelations, Simenon gradually shifts the unassuming Madame Jeanne from the wings to centre stage. The original title was L’Enterrement de Monsieur Bouvet (The Burial of Monsieur Bouvet). The most obvious title for the book is The Death of Monsieur Bouvet, but in choosing ‘Burial’ over ‘Death’ our attention is directed not to the event which triggers the action of the novel on the opening page (Monsieur Bouvet drops dead in the street), but to the downbeat final three pages in which the funeral procession is organised. That Simenon’s British publishers dispensed with his title is not surprising. The Burial of Monsieur Bouvet is hardly appealing as a novel marketed as crime fiction. Instead ‘Inquest’ provides the promise of investigation and revelation and the dropping of the ‘Monsieur’ gives the title a more hard-boiled, pithy ring.